Once upon a time ________ [insert name here] took their guitar into the enchanted forest, built a campfire, sat down on a log, and started to play. It took a while for the guitar to warm up, but when it started making pleasing sounds little monsters began coming out of the woods to listen. As the sound got better, more monsters came. 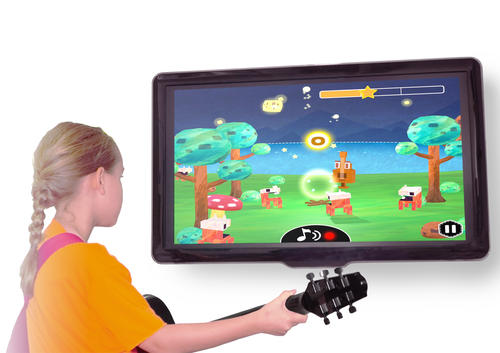 When the guitar sounded bad, some of the little creatures would become annoyed and return to the forest. This encouraged better playing. The little monsters were such a good audience that _______ decided to return every day. Their playing kept improving, and they enjoyed every minute. 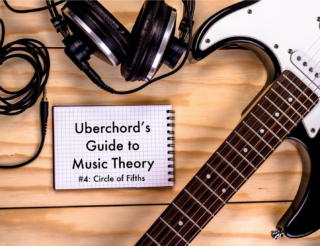 It doesn’t get any better than this: In an age when infotech wizards compete with each other to see who can make internet activity the most pointless, the clever folks at Animoca (Outblaze Ventures) are making use of Uberchord Engineering technology to teach beginner guitar. Their new app is called Monster Chords, and it’s amazing. Here is a download link of the app. Why Does it Have to Be Hard, Anyway? 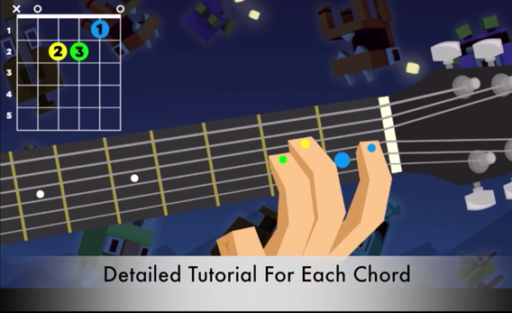 Learning how to play an instrument by rote and repetition is most music students’ least favourite learning activity, but Monster Chords turns it into a game that keeps you coming back for more, making skill development not just painless but entertaining as well. 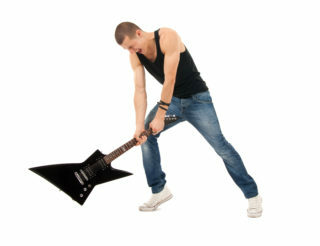 Although a little discipline never hurt, it’s been proven that children learn best through play, and so turning guitar lessons into play sessions is a very effective learning technique, helping even the most distractible child to focus long enough to develop enough mastery and self-confidence to persevere with guitar study. Even better, they’re learning not how to compete with others, but rather to compete with themselves, always trying to do better than they did last time— the only good kind of competition! So let’s get started. Get out your guitar and set your device (iPhone, iPad, or iPod Touch), open to Monster Chords, in front of you. You’ll need to get your guitar in tune or the sound recognition software won’t work. 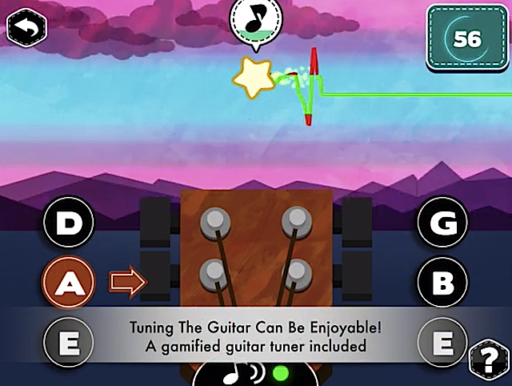 If it’s not in tune and you don’t know how to tune it, don’t worry— Monster Chords comes with its own easy-to-use guitar tuner that you can access at any time during play (and then easily return to where you left off). It works by means of a line that turns red or green (green is where you want to be) and then a ping and a star when you get the pitch right. And if you play for a while and the guitar starts going out of tune, the app will tell you, even before you notice the change yourself. Green is also the colour you wait for when the chord symbols float up out of the fire. When the ring around the chord symbol is green, you strum that chord, and if you get it right (i.e. 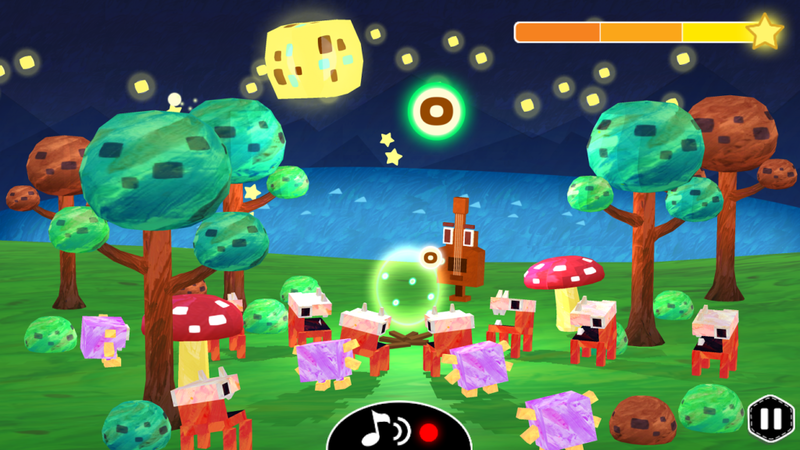 you play it smoothly along with the rhythm of the backround music), an adorable little forest buddy (these come in an assortment of shapes and colours) comes out of the woods and grooves on your music. If you make a mistake, they’ll start heading back to the woods again. You don’t want that, so you focus a little more, you try a little harder, and you bring them back with your smooth guitar sound. Keep moving happily through the thirty levels, each new level a review of what you did before, until you can play a whole song. After taking Monster Chords for a spin I decided to keep using it myself even though I’m an experienced player, and I also recommended it to an adult beginner I know. Far from seeming like work, coaxing the little creatures to come and join me at the bonfire was so refreshing that I could see myself playing around with this app even while feeling mentally exhausted after a hard day’s work. It feels like an escape, but real learning and technique improvement is taking place. It’s an idea whose time has come, and it may just be the wave of the future. 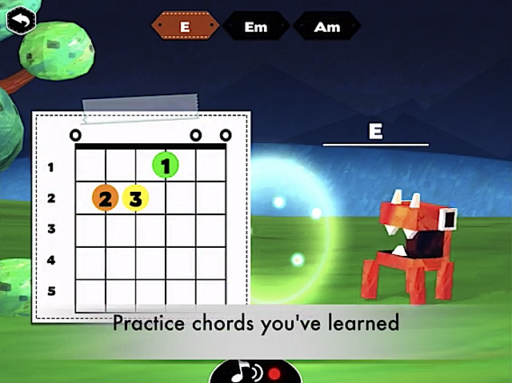 The Monster Chords subscription offers new songs and exercises every month so the learner can stay interested long enough to keep practicing without being told. 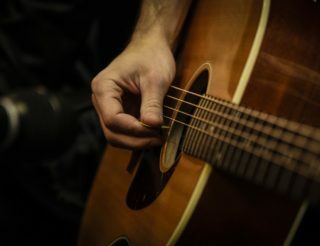 No special equipment is needed, just a guitar that has all its strings and can be tuned. 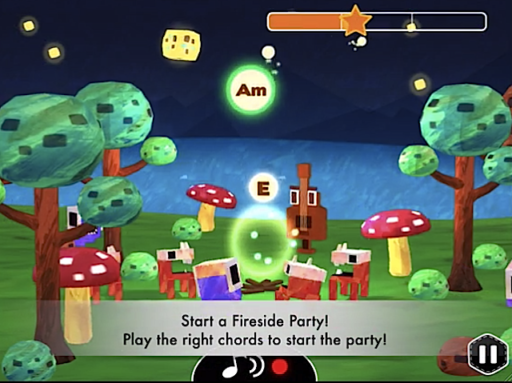 Monster Chords is now available on iPhone, iPad and iPod Touch in a dozen different languages, free of charge for limited access And for the small monthly subscription price of two dollars USD you can access all the features. 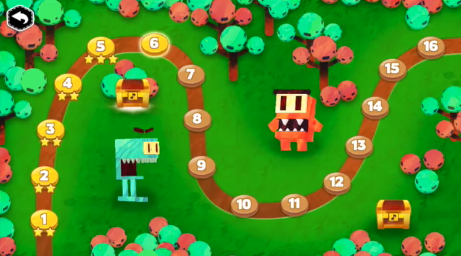 The first five levels in the app are free, so no excuses for not giving it a try! Follow Monster Chords on Facebook!